Chapel is our smart leather and tweed mix brogue. 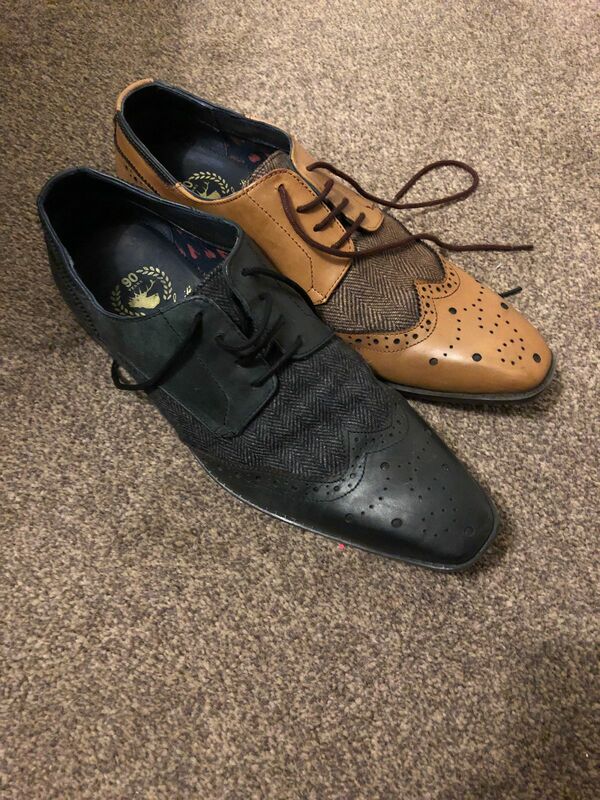 Wing tip brogue derby pattern upper featuring hand dyed leather quarter and toe cap with heavy duty herringbone tweed waist area. The famous stag debossed to heel tab. Leather and textile lining printed with GS stag logos and padded leather sock with GS logo embossed in gold. Durable and anti slip TPR sole branded with lots of GS detail. Available in Tan, Black & Bordo. This shoe features a high quality herringbone tweed, teamed with a heavy substance oily leather which becomes richer with character during wear. We combine a soft calfskin leather lining with a printed cotton skeleton for comfort and breathability. The sock and collar are not only luxurious, but they improve comfort and give the shoe strength and support in the key areas. This shoe utilises a TPR (thermoplastic rubber) sole for greater durability, flexibility, comfort and grip. Along with hard-wearing properties, the sole features the trademark Goodwin Smith detailing - because style and substance can coexist. Great delivery and fantastic quality shoes. As usual I must say. Excellent design with a “cloth like” feature across the middle. This shoe says “corporate” but with a subtle hint of style. It’s acceptable for the boardroom which is where I wear it. I also have the brown tan version and the brown leather is much better quality than these black ones. The black shoe feels plastic and a bit cheap. I would place it somewhere between Primark and M&S. Glad this shoe was in the sale, as it is a £50 shoe and certainly not a £120+ shoe. Thanks for the feedback Paul, apologies you feel this way, we work hard at putting the best quality into our shoes. I will ensure this feedback is passed on to our design team. The quality of these shoes is second to none, Even down to the packaging that they arrive in! I really like how they have a nice grippy sole and the material contrast is great. Always good quality shoes at an excellent price - which is why I keep coming back.